Athenahealth Recruitment Drive By Freshersworld.com- 1400+ Candidates Turnaround! On 7th May 2015, Freshersworld.com added one more successful story in its Recruitment drive Book. This time it was for our elite client Athenahealth. They were hiring Programmer / Software Analyst for the Chennai location. It was an Exclusive Recruitment Drive through Freshersworld.com for the B.E/ B.Tech – (CS/ IT/ IS/ECE/ EEE) / MCA candidates from 2014/ 2015 Batches with an aggregate of 65% throughout. This Drive was for the Premium members of Freshersworld.com and was a great opportunity for them to start their career with a NASDAQ listed MNC. They offered a package of 5.75 LPA and stressed on the skills like C / C++ / Java / Perl, Exposure to Web 2.0 technologies, SQL, UNIX, and Oracle etc. The drive was conducted at “The Oxford College of Engineering”, Bengaluru, which witnessed a footfall of more than 1400 candidates. On the Day of the Drive, the recruitment process started around 9.00 am, the Hiring Process consisted of Aptitude-test followed by online programming test and Interview. The drive ended around 6.30 Pm, Eight dedicated Freshersworld employee presided the drive throughout the day. It was a challenge for the Freshersworld team to make it a dream success, as the job opening was for the Chennai location and the drive was conducted in Bangalore. Freshersworld dedicated effort resulted it as a grand successful drive. This drive has boosted the confidence among the freshers, especially among the premium members. Premium members are now very much enthusiastic for more upcoming MNC Drives from freshersworld.com. Freshersworld’s effort has motivated Athenahealth for further engagement in future. 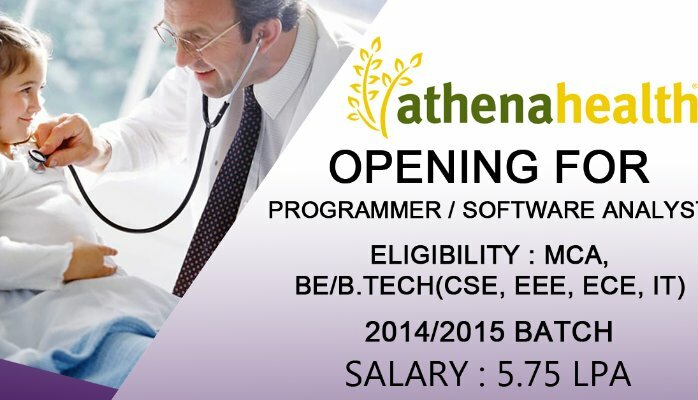 We have a strong bonding with Athenahealth, for last 3 years Athenahealth are conducting recruitment drives through freshersworld.com. More exclusive recruitment drives are coming from Freshersworld.com and it has raised the craze for Freshersworld Premium membership among the Freshers!! !